I preached this sermon at the Unitarian Universalist Fellowship of the Peninsula on December 24th 2018. This is the time of year when it’s not hard to find one of a number of traditional holiday movies on the television, from How the Grinch Stole Christmas to Frosty the Snowman, from A Christmas Story to Die Hard. Another that you’ll find is A Christmas Carol, which, like The Grinch, has been adapted in various ways, from the Patrick Stewart’s theatrical production to Mickey’s Christmas Carol featuring Scrooge McDuck, from the modern version with Bill Murray as a cynical and selfish television executive to the 3D animation and its Scrooge flying through the air in a rather short night gown that has scarred all our memories forever. Given all of these adaptations, we’re familiar with the basics of Charles Dickens’ novella, which was first published in 1843. There has been much debate as to whether A Christmas Carol is a Christian allegory or if it’s a fully secular story. Much like The Grinch, it’s about someone with a mean, cold heart discovering the true meaning of Christmas. As one person has put it, “A Christmas Carol is the heartwarming tale of how rich people must be supernaturally terrorized into sharing.” And yet, while Dickens’ novella mentions Christmas some ninety times, it does not mention Jesus even once. This is somewhat curious, because it’s not that Dickens himself was not religious. He was christened and reared in the Church of England, and he was at least a nominal Anglican for most of his life. Thanks to some experiences early in his life, he developed an aversion to evangelical zeal, doctrinal debates and sectarianism in general, and he turned to Unitarianism for a while during his thirties. Though he went back to the Church of England later on, he continued to associated with Unitarians for the rest of his life. At the time, though, Unitarianism in England — as well as here in the United States — was very much a Christian faith, so that’s not the reason why Dickens chose not to mention Jesus even once. Even if A Christmas Carol is not explicitly religious, it nonetheless portrays values taught by Jesus: changing indifference into love, changing selfishness into generosity, amplifying the spirit of hope in humanity. Some might argue that these are also humanistic values — and, for that matter, the redemption of someone described as “a squeezing, wrenching, grasping, scraping, clutching, covetous, old sinner” is pretty Universalist — but maybe that’s because Dickens was aiming for an important distinction. After all, what matters about Christmas, as exemplified by those values, is the religion of Jesus, not a religion about Jesus. For A Christmas Carol, The Grinch and other stories lifting up the true meaning of Christmas to center Jesus would make them feed into the narratives of a religion about Jesus; by centering Christian, humanistic values, on the other hand, they are demonstrating the religion of Jesus. And that’s much more powerful and will serve the world much better. “Still the Ghost pointed downward to the grave by which it stood. Scrooge crept towards [the grave], trembling as he went; and following the finger, read upon the stone of the neglected grave his own name, Ebenezer Scrooge. It is at this point that Scrooge gives up his defiance to Christmas past and present, making a promise to honor Christmas in his heart and to try to keep it all the year. He says he will learn the lessons offered by the three ghosts that have visited him, if only it will change what is written on that gravestone. What’s bothered me is that this scene is portrayed in the various movies as if it’s Scrooge simply seeing his own grave that changes him, that finally thaws his heart. It’s as if he never thought he would die, but now seeing the evidence of his own mortality, he promises to change his ways as if that means he won’t die. And then Dickens goes on for another couple of pages about Marley being dead, in one of his apparent tangents that feeds the myth that he was paid to write by the word. Furthermore, part of Scrooge’s time with the Ghost of Christmas Yet to Come involved witnessing the Cratchit family as they grieve the death of Tiny Tim. For all that Scrooge was miserly and mean and greedy and inconsiderate, he was hardly stupid, so I don’t see why he would have harbored any illusions regarding his own mortality. Rather, and this is a point to which I don’t believe the various movies have done justice, seeing his own grave forces Scrooge to realize he’s not leaving anything of any value behind. For all the wealth that he accumulated during his lifetime, there’s nobody to mourn him. The only people who feel emotion over his death are a couple who are happy that they now have more time to put their finances in order. And it is clear that Tiny Tim, a young boy whose short life had been defined by illness and poverty, leaves behind a much greater legacy than Scrooge. This stark realization is what makes him finally vow to change his ways, not so that he can somehow prevent his death someday, but so that when he does die, there will be people who mourn him because they love him, people who will be inspired by his example, people who will find meaning in their lives thanks to his legacy. This is when Scrooge realizes the true meaning of Christmas. There’s another part of the story that is usually overlooked in its movie adaptations. The Ghost of Christmas Present is often portrayed as a larger-than-life figure of plenty, more Father Christmas in his origins as a Green-Man-type god of nature than a sanitized Santa Claus. And yet, toward the end of this spirit’s time with Scrooge, the miser notices two small figures lurking in the folds of the ghost’s robes. “They were a boy and girl. [Jaundiced], meagre, ragged, scowling, wolfish; but prostrate, too, in their humility. Where graceful youth should have filled their features out, and touched them with its freshest tints, a stale and shrivelled hand, like that of age, had pinched, and twisted them, and pulled them into shreds. Where angels might have sat enthroned, devils lurked, and glared out menacing. No change, no degradation, no perversion of humanity, in any grade, through all the mysteries of wonderful creation, has monsters half so horrible and dread. “Scrooge started back, appalled. Having them shown to him in this way, he tried to say they were fine children, but the words choked themselves, rather than be parties to a lie of such enormous magnitude. Dickens wrote A Christmas Carol with a moral in mind, and it’s not as simply as “selfishness is bad and generosity is good”. Though born into a middle-class family, he experienced poverty as a child, and it gave him, according to one biographer, a “deep personal and social outrage” that heavily influenced his outlook on life and his writing. But whereas Scrooge’s attempts to ensure that he never suffered turned inward, making him a miser, Dickens’ developed a social conscience, particularly a concern for children whose families were affected by the working conditions resulting from the industrial revolution. In the same year he wrote A Christmas Carol, his anger was fueled not only by witnessing the appallingly unhealthy and unsafe conditions experienced by tin miners, but also by the fact that those mining the tin were children. He saw further suffering at one of London’s schools for illiterate and half-starved homeless children, and he joined efforts to change these conditions. In a speech that year, Dickens urged workers and employers to join together to combat ignorance with educational reform, but he soon realized that he would be most effective in reaching the most people not with pamphlets and essays but with a heartfelt story about the social effects of poverty and injustice. In this scene with the Ghost of Christmas Present, the spirit is not so much making its point about Ignorance and Want to Scrooge, who, at this point, still doesn’t get it, but to the reader, both then and now. Certainly children are no longer made to work down mines or sent up chimneys, but childhood poverty is very much a problem in our society, and public education as a means to lift up individuals and families is under attack. The moral of A Christmas Carol is still very much relevant today, not simply the tale of a mean and selfish man who is frightened into changing his behavior, but a warning to society at large that treating children so badly is hypocrisy — indeed, nothing short of evil — when our society spends more time and effort claiming Christian values than it does actually putting them into practice. As Dickens wrote in the surprising brief preface to the novella, “I have endeavoured in this Ghostly little book, to raise the Ghost of an Idea, which shall not put my readers out of humour with themselves, with each other, with the season, or with me. May it haunt their houses pleasantly, and no one wish to lay it.” As we prepare to enjoy this Christmas with friends, family and loved ones, as we celebrate the season in whatever ways fill us with joy, may this favorite story of transformation and redemption continue to haunt all of our houses. I preached this sermon at the Unitarian Universalist Fellowship of the Peninsula on January 14th 2018. I’m going to begin by asking for a favor. We’re in the South, more or less, and there are a few foods that are known for being popular in the South. To pick a couple of them, one is fried chicken and another is watermelon. Maybe you don’t eat either of these at every meal, but perhaps you’d eat one or the other if they were served at a picnic or a potluck. So how many of you would eat fried chicken? Hands up if you’d eat fried chicken. And how many of you would eat watermelon? Hands up if you you’d eat watermelon. Okay, so that’s pretty much everyone, whether vegetarian or not, who’d eat one or the other. Now I picked these two foods because there are parts of them that you can’t eat. In fried chicken there are bones and in watermelon there’s the rind. When you’re eating these foods, those are the parts you leave on the plate. So here’s something you might not have thought about, but it’s an important question: Do the bones and the rind stop you from enjoying the parts of fried chicken and watermelon that you do eat? No, they don’t. Much less would it make sense to get angry at the chicken bones and the watermelon rind because you can’t eat them. The reason I bring up fried chicken and watermelon and the fact that there are parts of them that you can’t eat is because a lot of discussions about religion are the same way. A friendly discussion about religion is, in fact, a lot like a picnic or a potluck. There are parts that appeal to us, that we like, that we enjoy, and there are parts that are, essentially, inedible. Now I want to stress the “friendly” part of “a friendly discussion about religion”. I’m not talking about somebody making religious claims that are actively harmful, that promote inequality or prevent injustice. That would be like bringing a plate of poisonous toadstools to a picnic: they’re not going to be good for anyone! So imagine you’re in a group with other friendly people — such as the Sunday Morning Forum or a Fellowship Circle — and the topic is how we view and understand the world and our place in it. You’re sharing your answers to questions such as: Why are we here? How did reality come into being? Why do bad things happen to good people? What happens to us when we die? More importantly, you’re going to hear the answers that other people have to those questions. Some of their answers you’ll like; they make sense to you, maybe even helping you to understand something that’s been puzzling you. Some of those answers will challenge you, but then you figure out they’re actually familiar ideas expressed in unfamiliar ways, or they use different words than you’d use; you’ll have to work at translating those answers into your own terms to appreciate them. And some of those answers will simply be unacceptable to you, with ideas that are clearly incompatible with your own experience; they make no sense to you no matter how you try to translate them. Here’s the favor I’m asking of you, and why I asked you to think about fried chicken and watermelon: enjoy other people’s answers that work for you, with or without translation, but don’t get angry at answers that don’t work for you. For one thing, other people’s answers belong to other people; if you like them, if they make sense to you, great; if you don’t like them, if they don’t make sense, well, they’re not your answers anyway. For another, getting angry at somebody else’s ideas, experiences and feelings, that does more harm to you than it does any good. So when it comes to discussions about religious matters between friendly and well-meaning people, please, do enjoy the fried chicken and the watermelon of the theological potluck that’s offered to you, and please, don’t get angry at the chicken bones and the watermelon rind just because you can’t eat them, too. I asked for this favor up front because our subject today is God, and I don’t think there’s any subject about there’s more disagreement. For many people, it’s the most important part of their faith, and they don’t understand how any religion can exist that doesn’t put God front and center. Only, ask them and the person in the pew next to them how they actually understand God, and you’ll quickly find that even people going to the same church don’t really share the same theology. Many religions got their start because of disagreements about understandings of God, and Unitarian Universalism is no exception. Both Unitarianism and Universalism began with quite specific theological ideas that departed from Christian orthodoxy. For the early Unitarians, it was their belief that God was one — a unity, not a trinity — including the specific belief that Jesus was fully human and thus a viable role model for what it means to be human. For the early Universalists, it was their belief in God’s love as the strongest force in existence, stronger than the ability of any mere human to do wrong, such that every soul eventually reaches heaven. Over the centuries, both Universalist and Unitarian belief systems evolved, growing much broader than their Christian origins. The Unitarians did this, as I see it, largely by accident, thanks to such spontaneous movements within Unitarianism as Transcendentalism and Humanism. The Universalists, on the other hand, did it much more intentionally, embracing the implications of Universalism as a religion that could truly be for all people. Either way, by the middle of the twentieth century the Universalists and the Unitarians found themselves in such similar places theologically that the American Unitarian Association and the Universalist Church of America joined together, consolidating to form the Unitarian Universalist Association in 1961. Now there was a habit, particularly within Universalism, of writing statements of belief, articulating who we are and how we understand the world not only for the benefit of other people but also for ourselves. Our Seven Principles and Six Sources are part of that long tradition. Such statements have been crafted in different ways at different times, but one of the favorite tools is, of course, the survey. And while a survey is rarely an effective substitute for getting people together and talking with them, it is an easy way to get a lot of people to answer simple questions. So in the 1960s, 70s and 80s, the UUA sent surveys to UU congregations. Somebody at the UUA deserves credit for having the presence of mind to include some of the same questions each time, to see if anything was changing. Specifically, there was a multiple-choice question, “Which one of the following comes closest to expressing your beliefs about God?” What’s striking is that, in all three decades, the distribution of responses was very similar and, though I don’t think there’s any more recent data, my own unofficial experience suggests it would be pretty similar today. The first answer choice (out of five in all) was “God is a supernatural being who reveals himself in human experience and history.” We might consider that the traditionally theistic belief and, like it or not, such a traditionally theistic God is usually imagined as male. About three percent of UUs selected this answer choice. The second answer choice was “God is the ground of all being, real but not describable.” If you’ve ever heard of theologian Paul Tillich, the phrase “ground of being” comes from him. This answer choice spans deism, mysticism and some agnosticism, and close to thirty percent of UUs selected it. The third answer choice was “God may appropriately be used as a name for some natural processes within the universe, such as love or creative evolution.” This is the answer of choice for many humanists and neo-pagans, from physicists to pantheists, and it’s not surprising that almost half of UUs selected it. The fourth answer choice was “God is an irrelevant concept, and the central focus of religion should be on human knowledge and values.” This is more hard-core humanism, as well as atheism, and a fifth of UUs selected it. And the fifth and final choice was “God is a concept that is harmful to a worthwhile religion” and about two percent of UUs selected it. As I said, this distribution of responses matches my own experience in talking with Unitarian Universalists over the years. A small number of UUs are pretty traditional theists, while about three-quarters of UUs have broader conceptions of divinity, even if they’d never apply the word “God” to them. About a quarter of UUs think that God is either an irrelevant concept or actively harmful. Let me get my pedantry out of the way. The hymn “Once to Every Soul and Nation” doesn’t include the word “God”. Just in case Baltimore was doing something oddly retro, I even looked it up in the 1964 hymnal, Hymns for the Celebration of Life, where it was called “Once to Every Man and Nation”, but still no “God”. I should note that many of those hymns that went on to be in our current hymn book were indeed edited in the late seventies, but in most cases that was to remove unnecessarily gendered language that privileged men. When it came to the word God, there was no attempt to “scrub” “religious doctrine” to make hymns “politically correct”, whatever that much abused phrase actually means these days. We still have lots of hymns that refer to God— just not the one in the article. Rather, the problem identified in some of the old hymns was always referring to God as male. By way of response to the article, here’s my colleague, the Rev. Dr. Victoria Weinstein. So right away we come off as bizarre-o. This isn’t just a word I’m throwing out there to be funny; it’s one Unitarian Universalist’s reminder to the rest of us that when it comes to our image in the broader culture, we appear to be so far off the beaten track of what constitutes religion [that] the wheels have fallen off our truck. That first paragraph reveals us at our weirdest and worst: irrational, ‘pre-offended’, entitled, immature and quarrelsome. […] I’m not sure if the reporter edited Mendes’ remarks or not, but there is the further issue about why a profession of faith is in the least objectionable in a [UU congregation]. It is not: we recite them all the time[.] But someone has taught this conscientious lay woman well: she is on red alert for offense and is obviously walking on eggshells, the hallmark of a highly anxious system. Weinstein does acknowledge that the rest of the article almost redeems itself from what she calls “the wackadoodle impression made in the first paragraph”, though she notes that, in contrasts to the five ordained men quoted in the article, “the one woman interviewed is also the only lay person the reporter talked to, and she is portrayed as being insecure and apologetic.” Clearly there are bigger problems than whether a hymn uses the word “God” or not. In short, and this is why I asked up-front for a favor about not getting angry at things that don’t feed us, we need to get over ourselves when it comes to “religious” language. Actually, we are doing better in that regard than we were fifteen years ago, when then-recently elected president of the Unitarian Universalist Association, the Rev. William G. Sinkford, suggested that UUs should reclaim a “vocabulary of reverence”. The uproar only calmed down when Sinkford issued an open letter promising that he wouldn’t make anyone use the word “God”. Now, I have to say that I stopped using the word “God” back in high school when I realized I was an atheist. A decade later, I learned about pantheism, and I was okay identifying the Universe as God on the basis that it didn’t say anything about the Universe but rather said something about us and our emotional response to existence. Then, in the UU congregation I joined, it was clear that “God” was not a helpful word because so many people had been hurt by churches and people with unhealthy ideas about God, particularly in how God has been used to justify oppression and suffering. And going to seminary, I learned the art of theological translation: Could I simply accept what someone else said? Or should I translate it into my own terms, such as replacing “God” by “Universe”? Or did I just need to set what they’d said aside and leave it? I still don’t use the word “God” without good reason, but I am realizing that there is a time and a place for it. For instance, I reject male-centered ideas about God, but I have found that I am quite okay with — and even enjoy — the lifting up of female divinity. Did you hear, for instance, that Roy Moore was actually correct when he said that the election in Alabama was in God’s hands? Only, what he doesn’t know is that God is a black woman. So let me finish with this. over the course of the past two hundred years, in the name of justice and liberation, religious liberals have hastened the death of God. We have presided at the funeral of God the King, God the Father, God the Unmoved Mover, God the Old White Man in the Sky, the Able-Bodied God, the Straight God, the All-Knowing God, the Leave-It-All-to-Me-and-I’ll-Take-Care-of-It God, and more. In place of God, we have emphasized human responsibility. We know it is in our hands to create justice, equity and peace. I will qualify this by saying that the problem was never God. The problem was that God was too small. The problem was that God was made in man’s image — and I do mean “man” because the problem was that God was imagined as a man, a supposedly powerful man, the sort of being that men imagine themselves to be if only they had all the power (and none of the responsibility) in the world, a justification for men to act as they please in the cult of toxic masculinity. Have you ever noticed that whenever someone declares that something is what God wants, it’s also what that person wants? Amazing! That’s how you know that their God is only a small god, and is no bigger, in fact, than their own ego. And not only is such a small god an excuse for selfishness and greed, but it’s also an excuse for failing to act when there’s a real need. Furthermore, while we have hastened the death of a small god, we have also midwifed the birth of a God who is a working mother, a God who is gay, a God who is black or brown, a God who is transgender, a God who is disabled, a God who is sick, a God who is imprisoned, a God who is poor, a God who is in recovery, a God who rejects toxic masculinity and white supremacy, a God who sides with the oppressed and downtrodden, a God who is begging us to bend the arc of the moral universe toward justice. And that’s the place where, no matter what we mean by the word “God” or even if we choose not to use it, we can find common ground. I have long said that it doesn’t really matter what each of us believes; rather, what matters is how we behave. Sure, our beliefs determine our behaviors, but we are judged by our behavior. When someone works for justice, equity and peace, when they are kind and charitable and generous, maybe they don’t believe in God and they’re doing good because it’s the right thing to do, or maybe they believe in God and they’re doing good because that’s how God manifests in the world. Such beliefs are not incompatible when it comes to making the world a better place, because what matters is making the world a better place. May that be the true measure of our beliefs, now and always. I preached this sermon at the Unitarian Universalist Fellowship of the Peninsula on February 26th 2017. I was an impatient child. I wasn’t very good at waiting for ordinary things, but I was particularly bad at waiting for Christmas and Easter. I’d like to think my impatience for Christmas was a little more noble than mere avarice for presents. It was, after all, a holiday of family and delicious food and beautiful decorations. But Easter… No, I think my impatience for Easter really was all about the chocolate. When Lent started in the early Spring, it was just a way of counting down the days until that glorious morning when we cracked open all those chocolate eggs. For all that I think impatience goes hand-in-hand with being young, I’m not sure that becoming more patient was something that happened naturally as I grew up. Rather, I had to learn how to wait. Sometimes, I have realized, I still have to work at being patient. But I have also come to recognize that there are some places in which patience is inappropriate, where simply waiting for some things to happen may even be wrong. The heart of Dr. King’s book, Why We Can’t Wait, is his “Letter from Birmingham Jail”. Written in 1963 in response to a critical statement by eight Alabama clergymen, Dr. King started writing his letter on the margins of the newspaper in which the statement was published, continued it on scraps of paper supplied by another prisoner, and finished it on a note pad that Dr. King’s lawyers were eventually allowed to give him. Acknowledging that he rarely took the time to respond to criticism of his work and ideas — the irony being that in the jail’s solitary confinement, he had little else to do — Dr. King felt it important to address the charge by the eight clergymen that his activities in Birmingham — particularly the protests and demonstrations — were “unwise and untimely”. Part of Dr. King’s justification for the Southern Christian Leadership Conference’s work in Birmingham was that they had followed a reasonable course of action, a series of basic steps, such that protests and demonstrations hadn’t simply come out of nowhere. First, they had collected the facts to determine whether there was injustice or not. Finding that there was injustice, the black community’s leaders had tried to negotiate with the city’s leaders; the latter consistently refused. They made more progress with local business leaders, but all of the promises that were made — to remove, for instance, the racist signs in store windows — were soon broken. So they prepared themselves for more direct action against injustice. Dr. King called it “a process of self-purification”, holding workshops on non-violence and repeatedly asking themselves if they were prepared to be beaten without retaliating, if they were willing to go to jail and endure further physical and spiritual violence. They even waited for Birmingham’s election for mayor to be over, given that there was chance that “Bull” Connor might be elected, and they didn’t want demonstrations to be used as an excuse for him to win. The timing was, of course, part of his critics’ complaint, to which Dr. King responded that there has never been a direct-action campaign that was considered timely by those who were not suffering injustice. But to those who are suffering, the call to “Wait” has almost always meant “Never”. Today is the fifth anniversary of the killing of Trayvon Martin. Five years ago today — five years ago this evening — the seventeen-year-old was walking home from a 7-11 where he had bought candy and a soft drink when he was shot and killed by a Neighborhood Watch volunteer. At first Martin’s killer was not initially charged by the police, but amidst massive public outcry there was an investigation and eventually a charge was made. I preached a sermon at about that time, describing something of which so many of us in our white privilege had been completely ignorant up until that time, but which was now part of the public discussion about the intersection of race and fear and violence, thanks to the death of a boy deemed suspicious thanks to his clothes and the color of his skin. Known as “the talk”, it’s the advice that many African-American parents say they feel compelled to give their children, particularly their sons, even before they become teenagers, advice that has been passed on for generations. That sermon, five years ago, was about the Arc of the Moral Universe, and the idea, originally from Unitarian minister Theodore Parker and amplified to great effect by Dr. King, that the arc of the moral universe is long, but it bends toward justice. But I have to wonder, looking back over the last five years, has the arc of the moral universe bent any closer to justice since Trayvon Martin was killed? It gained much wider recognition, of course, and this is when most of us became aware of it for the first time, when it became a rallying cry following the killings of Eric Garner in Staten Island NY and Michael Brown in Ferguson MO, both in 2014. We started to see “Black Lives Matter” on signs and banners, and since it was a new concept for white people, we began to work on figuring out what it means. So, I’ve preached on Black Lives Matter a number of times, and Joanne has preached on it, too. Christina Hockman preached on Black Lives Matter during the course of her internship with us, and Walter has, too. Based on my conversations with people — not to mention the evident willingness to take and wear and continue to wear the Black Lives Matter buttons I purchased — I believe that, as a congregation, we’ve come to understand what it means. We understand, for instance, that it’s not anti-police. We understand that it’s not saying that only black lives matter. And we understand that responding to Black Lives Matter by saying “all lives matter” is not acceptable. Now that might simply be naïve idealism. After all, as Unitarian Universalists we have promised to affirm and promote the inherent worth and dignity of every person, and we’ve been using those words since the 1980s. Obviously we believe that in theory all lives matter. But the actual phrase, “all lives matter”, never existed before Black Lives Matter came into being. It’s a direct reaction to Black Lives Matter, and it’s a deliberate assertion of white supremacy. The fact is, all lives will only matter when black lives matter, too. But if we’ve been figuring these things out here, well, that’s certainly not the case beyond our own walls. My quarterly column in the Daily Press last August addressed the Black Lives Matter protests that followed the killings of Alton Sterling in Baton Rouge LA and Philando Castile in St. Paul MN. There’d been peaceful protests across Hampton Roads, many in cooperation with police departments, and they’d been covered by local media. None of that was a problem. The problem was the responses from otherwise anonymous members of the public. Let’s set aside the few twisted souls who fantasized about driving their cars into crowds of protestors. Consider, though, the banality of evil as represented by so many comments about the inconvenience of protests on roadways, displaying ignorance and an utter lack of compassion for an entire swath of fellow citizens who, in their everyday lives, are simply terrified of being killed. In response to my column, I received an e-mail from a reader. They expressed disappointment that a minister would write what I wrote. They insisted that all lives matter. They instructed me to preach to black people about how not to get shot. They informed me — “incidentally” — that they have many black friends and co-workers. And they told me that I misrepresented Unitarian Universalism. Well, that person clearly doesn’t know Unitarian Universalism, much less did they know that at the previous Summer’s General Assembly, the Unitarian Universalist Association had adopted an Action of Immediate Witness in clear support of the Black Lives Matter movement. Yes, Unitarian Universalism is on public record as supporting Black Lives Matter. Now thankfully there is work on this — good, productive work — being done in the wider community. Here on the Peninsula, for instance, there’s a monthly meeting known as the Pastors’ Dialogue on Racism, Violence and Poverty. It began, I understand, as conversations between baptist clergy and police, and has broadened into quite an ecumenical gathering. Actually, the presence of Walter and myself at those meetings makes them interfaith, though I’d dearly love to see some rabbis and imams and leaders of other non-Christian faiths there, too. Through these meetings, I’ve learned about lots of good work that’s being done by the Peninsula Baptist Association and other groups to help young people of color, particularly young black men. They’re good programs, helping people who are otherwise getting the short end of society’s stick, though I am bothered by what seem like occasional parallels with programs that aim to teach women how not to get raped. Last month’s Pastors’ Dialogue, for instance, was at an office of the Hampton Police Department, with a focus on their community outreach and work with youth. It’s all good work, about building relationships with people, but I was troubled by some of the sub-text, even by some of the expressed motivation for the work. For instance, the police officer making the presentation pretty clearly stated, at one point, that teenagers are destined for delinquency unless police intervene to treat them as criminals if they don’t stay in school. That just doesn’t jibe with my belief in the inherent worth and dignity of all people. At the end of the presentation, there was a questionnaire for us to complete about how the police and the community relate to one another and what could be done to improve those relationships. I have to say, too many of the questions were focused on individual actions and choices, rather than acknowledging that we’re embedded in a social system that limits our actions and pre-determines many of our choices for us. I mean, maybe if the economy wasn’t increasingly serving the wealthiest, maybe if climate change wasn’t being ignored, maybe if society wasn’t telling our children that they have no future, then maybe they’d see the purpose of staying in school. And you know what I’d like to see as the outcome of good relations between the police and the community? For me, the outcome would be that no African-American family would feel the need to have “the talk” with their children. There’s a video that some of you may have seen recently. Entitled “What it’s felt like since the election”, it begins with a man waking up to the sound of his alarm clock. He yawns, then he stretches, then he looks at his ‘phone, then he starts screaming. Later in the video we see him looking at his computer with a friend. They’re both screaming, and it turns out they’re watching the video of the goat whose cry sounds like a person screaming. They both laugh, and then they go back to screaming. At the end of the video, we seem him walking across a park, screaming. There’s somebody throwing a frisbee, screaming. There’s a couple enjoying a picnic, both screaming. There’s someone reading a book, screaming. And as the camera pans across the park, showing us all these people doing all these things and all of them screaming, we see that there are two black men standing together, watching it all, too, and they are not screaming. The video is called “What it’s felt like since the election”, but the title should really be “White people are finally screaming”. Now white people — a lot of us, anyway — are starting to get some inkling of the terror that black people have been feeling for hundreds of years. Understandably, some black people are upset that this is happening now. Where have white people been for the last five years? For the last fifty years? Others, thankfully, are ready to welcome us aboard — better late than never — so long as we follow their lead given that they have been doing this work so much longer than us. Has the arc of the moral universe bent any closer to justice in the five years since Trayvon Martin was killed? Not that I can tell, but maybe it will now, now that white people are screaming, too. This Wednesday is Ash Wednesday, the start of Lent, the forty days in the Christian liturgical calendar that lead up to Easter. 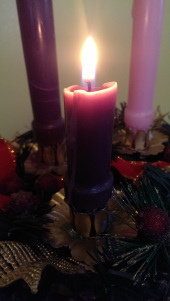 As I’ve said before in regards to both Advent and Lent, they’re not just about passively waiting, whether for Christmas or for Easter. They’re not just about expectation, even hopeful expectation. Rather, they’re about active preparation. These are seasons that demand action. So I’m taking the opportunity today, offered by the start of Lent on Wednesday, to make the otherwise simple point that we can’t just wait for things to change. The arc of the moral universe, for instance, doesn’t bend toward justice all by itself. It bends because we push on it, because we apply the weight of our souls to make it bend. And guess what? Not only does it resist bending, but there are special interests which — for reasons of power or fear or money — are trying to bend it away from justice. Remember how the Voting Rights Act, the landmark achievement of the civil rights movement, had its heart ripped out by the Supreme Court a few years ago? And now, as a direct result, the state of North Carolina is no longer a democracy, with other gerrymandered states doing their damnedest to follow suit? That’s the arc of the moral universe being bent away from justice. So we can’t just wait. One way in which we’re not just waiting here, is that we’re about to make own public declaration of support for Black Lives Matter, by putting up a Black Lives Matter banner on our office building, where it will be clearly visible on Warwick Blvd. Of course, putting up that banner is just the first step. We need to support Black Lives Matter 757, as some of you did yesterday at the demonstration in Virginia Beach. We need to engage other would-be allies, such as through a local chapter of Showing Up for Racial Justice. There’s a Racial Justice Conference for Youth and Adults at the Unitarian Universalist church in Charlottesville next month, centering voices from the margins and facilitated for the most part by women of color. We need to answer Walter’s stirring call to action from last Sunday. And doing these things won’t be without push-back. Chances are, our BLM banner will be vandalized. It’s happened at plenty of other churches. It happened to the first banner Walter displayed at his home. So we should have another banner ready in case we need it, and we should be ready to call the press immediately should something happen, and we should not take down the vandalized banner until the press come to take pictures and talk to us about it. Let’s make our demands known. We can’t just wait. You may have noticed that I’m all alone up here. If you’re a member or have otherwise been here long enough to know how we usually do services, you may have noticed that some things are missing this morning. If this is your first time here today: welcome, and I’m glad you’re here, and I apologize for everybody else’s confusion, but all will become clear, I promise. So what’s missing? The lay leader doesn’t usually have this much responsibility on a Sunday morning. We usually sing out of hymn books. We’d have lit our chalice by now, and in fact there’d be other flaming chalice symbols around the place, too. Even the Order of Service is missing a few words, such as calling this congregation the “Fellowship of the Peninsula”. Imagine that, then. Imagine this as some non-denominational congregation, a “Fellowship of the Peninsula” all alone in the world, without any larger faith tradition of which it is a part. Imagine, in other words, that there’s no Unitarian Universalist Association. How would a congregation like ours make do without the benefits and resources deriving from being part of that wider denomination? Well, let’s consider just one of those benefits and resources. Consider this hymnal, “Singing the Living Tradition”. It’s published by the Unitarian Universalist Association, and was the result of five years’ worth of work by the UUA’s Hymnbook Resources Commission. We’re used to singing hymns out of it every Sunday, maybe a reading from it, too, but without the UUA creating the commission and subsidizing their work and paying for copyright licenses and so forth, there’d be no hymnal. What would we use instead? Well, that’s a good question. Maybe the New Century Hymnal from the United Church of Christ, but perhaps only the hymns that are particularly liberal even for that liberal denomination. Maybe we’d be able to find more songs like “Weave”, songs that are appropriately “spiritual but not religious”, though without the Unitarian Universalist Association there’d be far fewer of those sort of songs, too. Thankfully the UUA does exist and does publish hymn books, so let’s bring in our copies of “Singing the Living Tradition” and hand them out now. Now, let’s see what else is missing. Well, there’s the chalice, but we’ll come to that in a moment. Before that, though, let’s talk about who else is missing. A very important function of the Unitarian Universalist Association is to evaluate and certify new ministers. And a big part of preparing ministers to be ministers is, of course, the training. There’s the academic work, which takes place at a seminary; there are two of those that are associated with the UUA, namely Starr King in San Francisco and Meadville Lombard in Chicago. And there’s the practical work of becoming a minister, which takes place at hospitals and in teaching congregations. We’ve been fortunate to be one of the latter these last two years, so it’s time to bring in our student minister, Christina Hockman! Now Chris graduated from Meadville Lombard one week ago — congratulations, Chris! — and came to us from her home congregation in Richmond. But if there were no Unitarian Universalist Association, we’d have no connection with Meadville to have one of their students here, and without the UUA, we’d have no connection with Richmond to have one of their members here. So thank goodness the UUA does exist! Yes, if it weren’t for the Unitarian Universalist Association, I wouldn’t have been your student minister these last two years, I wouldn’t now have a Master of Divinity degree from Meadville Lombard Theological School, and I wouldn’t have been been evaluated and certified ready for ministry. And maybe my life would have been rather simpler over the last three years were all of that the case, but my life would also be much less full and rich, given the wonderful people and the many experiences that have helped me become the person I am today. As I’ll describe next Sunday, it’s made a world of difference for me to be a part of this wonderful, warm, loving congregation. As most of you know, another major event for me this month was being called to serve the Unitarian Universalist Church of Corpus Christi in Texas. What you may not know is that, in addition to the schooling and training and certifying, the UUA plays a vital role in the search process, too. After all, most congregations don’t go directly to the ministers they want and offer them the job. There’s no magic to finding a minister who seems like a good match to a given congregation, and professional headhunters who would do the work cost more than almost any congregation can afford. So the Unitarian Universalist Association helps out, making the search process a lot easier for both congregations and ministers to find one another. There’s a website where both sides upload lots of information about themselves, about who they really are, about what they really want to achieve. It’s like match.com or eHarmony, only for congregations and ministers. Thanks to the UUA, then, ministers in search can identify congregations that seem like they’d be good places to serve, and then congregations can look at the ministers interested in them and decide who seems like a good fit. It’s thanks to the UUA, in other words, that I’m going to Corpus Christi. And since this congregation went through its own search process seven years ago, it’s thanks to the UUA that you have a minister, too. There’s something else that’s a feature of every Sunday morning that we owe to the Unitarian Universalist Association, and that’s our flaming chalice. It began as a symbol of hope and liberation, when it was created during World War II in support of the work of the Unitarian Service Committee as it helped refugees escape from Nazi Europe. A few decades later, the UUA adopted it as a symbol for its own documents, and as such congregations started using it, too. We have the flaming chalice on display here in this Sanctuary: on the wall, in a framed piece of the old pulpit; and on the front of this pulpit. Most obvious, perhaps, is that we also have a physical chalice in which we light an actual flame, a chalice given to us by former youth, Keith Dixon, many decades ago, a chalice that survived the fire that burned down our old building. Now that we have both hymn books and chalice, I would ask you to join me in speaking aloud, together and in unison, reading number 443, “We Arrive Out of Many Singular Rooms” by Kenneth Patton, while Scott lights our chalice. “We arrive out of many singular rooms,” seeking the assurances of friendship, community, presence and human contact. “This is the reason of cities, of homes, of assemblies in the houses of worship.” It’s the reason of congregations, and also of denominations — in our case, an association of congregations. And given the presence of hymn books and the chalice, given that Chris and I are present, too, we are also aware of the presence of that association, here in our own singular room of this Sanctuary. 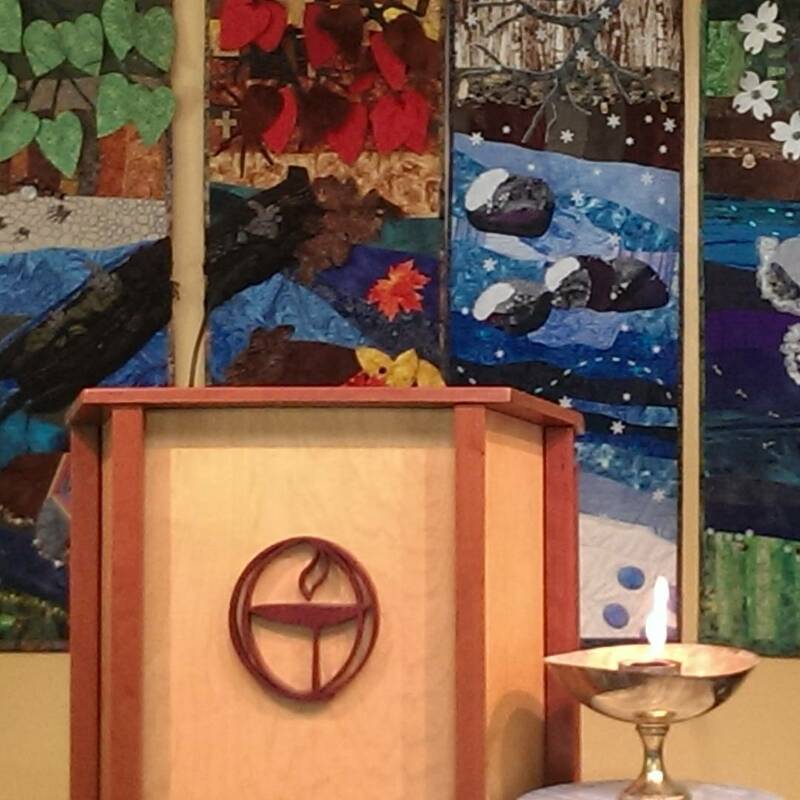 In some of the things we do, we draw attention to how they connect us with other Unitarian Universalist congregations. Last Sunday we celebrated the Flower Communion, as did other UU congregations that same day, and almost all UU congregations hold a Flower Communion service sometime in the Spring. And in the Fall, we and almost all other UU congregations hold a Water Communion service. Now for all that they seem timeless, it’s important to remember that these traditions had a beginning. We know that Maja Čapek brought the Flower Communion to this country during World War II, sharing it with some congregations, who then shared it with others. If it weren’t for those congregations being part of an association with one another, there wouldn’t be a Flower Communion. It’s less clear how the Water Communion started. I once heard that it began at a conference, perhaps a UU women’s retreat, and the participants took it back to their home congregations, who then shared it with others. Once again, if it weren’t for the association of those congregations, there wouldn’t be a Water Communion. And that brings me to the last thing that we need to uncover — the last thing we need to reclaim as part of recognizing that our association of congregations, the Unitarian Universalist Association, does indeed exist — and that’s our Joys and Sorrows table. Now it’s also not clear how Joys and Sorrows began, and it may even have been created in more than one place, given the number of different ways of doing it, but what is clear is that this congregation did not create it. We practice Joys and Sorrows here — every Sunday at first service, less often at second service — because we heard about it thanks to being part of a wider association of congregations. And, of course, part of how we do Joys and Sorrows is sing “Spirit of Life”, number 123 in the hymn book. Carolyn McDade wrote her sung prayer for reasons that had little to do with Unitarian Universalism, but it wouldn’t be as known and loved by so many UUs if it weren’t for the Unitarian Universalist Association. And so, in this community of compassion and gratitude, let us now take the time to share with one another what is in our hearts — our joys, our sorrows, and important milestones that are truly changing our lives. I invite you to receive and light a candle, then tell us your name, and briefly share what matters to you so much that you can’t not share it. You may choose to light a candle in silence, but if you do speak, please use the microphone so that everyone here this morning may hear your words. Thank goodness the Unitarian Universalist Association does exist! Without the UUA, we wouldn’t have hymn books full of inspiring words and music. Without the UUA, we wouldn’t have the flaming chalice, either as a symbol or as a physical object. Without the UUA we wouldn’t have beloved, meaningful rituals like Flower Communion and Joys and Sorrows. And without the UUA, Chris wouldn’t have been here as our intern, and I wouldn’t be here as your minister. Of course, there are many more benefits and resources we receive from being part of a wider association. Elsewhere on our campus this morning, for instance, our children and youth are engaged in religious exploration. Three of the RE curricula we’ve been using all this year, namely “Sing to the Power” for elementary-school-age children, “Building Bridges” for middle-schoolers and “A Place of Wholeness” for high-schoolers, come from Tapestry of Faith, a curriculum series produced by the UUA that congregations (or anybody, for that matter) can download and use completely free of charge. And next year, we’ll be offering Our Whole Lives, the comprehensive sexuality education curriculum for teenagers, which is a joint project of the Unitarian Universalist Association and the United Church of Christ. And if you’re a member you should have received this magazine in the mail just this week. UU World is published each quarter by the UUA and sent out to all members of congregations, and there’s always lots of fabulous content in it. This issue made me chuckle, though. The cover story is about the Unitarian Universalist Fellowship of Central Oregon and their rapid growth in recent years, and, as I scanned through it, I recognized a face in the pictures. So I looked more closely. It turns out that their first minister, hired in 2004, was Jeanne Pupke, my colleague at First UU in Richmond. Then, their first called minister a couple of years later was Heather Starr, who is now one of the co-ministers of my home congregation in Hartford, Connecticut. Then Central Oregon had an interim minister, Alex Holt, who I’ve met at Southeast UU Ministers Association meetings when he was in our region. And for the last couple of years, their minister has been Antonia Won, whose face I recognized in the article’s pictures, because she was student minister in Albuquerque immediately before I did my internship there! Now I want to note that this isn’t about me, though my life has been enriched in many different ways for knowing these colleagues. And it’d be easy to say, as if everything was explained, “Well, it’s a small UU world.” But the fact is, I wouldn’t know these wonderful people, I wouldn’t be working alongside them, if it weren’t for the Unitarian Universalist Association. After all, we tend to think of the Unitarian Universalist Association as an institution in its own right, doing its thing up in Boston. And we’ve already seen how, as an institution, it provides so much that we need as a congregation, but that’s an outcome, an end-result of what it means to be a congregation in covenant with other congregations, to be a member of an association of congregations. That’s the covenant that this congregation makes with all other Unitarian Universalist congregations, the promise we have made to be part of a wider association with a pledge of mutual trust and support. It’s what makes us, not just some non-denominational “Fellowship of the Peninsula” but rather the Unitarian Universalist Fellowship of the Peninsula. Just as members of this congregation covenant with one another to form the congregation, promising to support it with time, talent and treasure, so do member congregations of the UUA covenant with one another to form the association, promising to support it with the congregation’s time, talent and treasure. It’s a promise we make as the Unitarian Universalist Fellowship of the Peninsula, a promise that’s also made by those congregations in Central Oregon, Richmond, Hartford and Albuquerque, a covenant that holds us in relationship with them and with more than a thousand other UU congregations. “A pledge of mutual trust and support.” It should be pretty obvious why we make that promise: we can’t do it all by ourselves. Not even big congregations, like First UU in Richmond, can do it all by themselves. Consider the fact that we’re sending two of our own emerging leaders to leadership school this Summer. It’s not cheap to send two people for a week-long, immersive, residential program like that — so a big thank you to the trustees for agreeing to pay for about half of the cost from Endowment income — but it would cost even more if it weren’t heavily subsidized by the UUA. Or consider that, over the last twenty years, this congregation has benefited from two Chalice Lighter Grants, money that’s collected directly from participating members of other congregations in our region. The most recent grant was about $25,000 to pay for the renovation of our office building when we bought it six years ago. Or consider that, thanks to the association, we have a voice on national, even global, issues. Earlier this month, for instance, UUA President Peter Morales addressed LGBTQ clergy and other leaders in the United Methodist Church, recognizing their bravery and offering them encouragement as their own denomination struggles to be fully inclusive and welcoming. None of these are things we’d be able to do by ourselves. And recognizing that, we can be proud that this congregation has a long history of doing its part to support the Unitarian Universalist Association. Up until a couple of years ago, we were what is called a “Fair Share” congregation, meaning that we gave to the UUA an expected amount of money from our budget each year. I’ll note as an aside that this used to be calculated as a certain amount per member, but now it’s simply a percentage of the budget. The new method of figuring Fair Share — known as GIFT — is actually more fair, particularly since some congregations now admit that they used to play games with their membership rolls to try to reduce what they’d pay. Please know that this congregation did not play such games. In any case, the amount of our Fair Share didn’t change much from the old method to the new, and going back twenty-five years or more, in fact, we had been a Fair Share congregation. We can, as I say, be proud of that. Unfortunately, that changed a couple of years ago. Given our budget the year before last, we only contributed to the UUA about a third of our Fair Share. And in this year’s budget, as UUFP Treasurer Alan Sheeler pointed out last Sunday, there’s actually no money for the UUA at all. So we want to try to fix that today. If, as Scott said earlier, you’re a member or have otherwise been here long enough to know how we usually do services, you may have noticed that we haven’t collected the Offering yet. And as we usually say in introducing the Offering, all that this Fellowship is and all that this congregation has are what we bring to it: our time, our talents, our capabilities and concerns, and our money. Well, the same is true of our association: all that the UUA is and has are what we give to it. So today we’re going to share our Offering with our UUA. Now I’m not deluding myself that a single Sunday’s Offering would allow us to pay our full Fair Share to the UUA. That would be truly fantastic, in the original sense of the word. But I do see this as a first step back to making good on the promise we make as a congregation, the covenant that we have entered in association with our sister congregations. And so, in gratitude for the resources and services that come to us from the UUA, in recognition of the benefits and advantages that follow from being part of a wider association, and in keeping our promise of mutual trust and support to our sister congregations, let us now collect the offering, and, as is our tradition, receive it with the singing of hymn number 402, “From You I Receive”. You can make your contribution on-line now. Just click here and look for the box marked “UUA GIFT Contributions. One of the activities that’s part of our quarterly Orientation to Membership workshop is the “values continuum”. Laying out a piece of string on the floor, we describe a number of scenarios where one end of the string represents somebody holding one set of values and the other end represents somebody holding contrasting values. For each scenario, we ask the workshop participants to place themselves on the string based on how their own values align, and then we invite them to share their reasons for where they’ve placed themselves. “There’s no such thing as a good individual in isolation; rather there is a good individual in relationship: the decisive forms of virtue are socially incarnated.” Here’s my reflection on hope in dismal times. 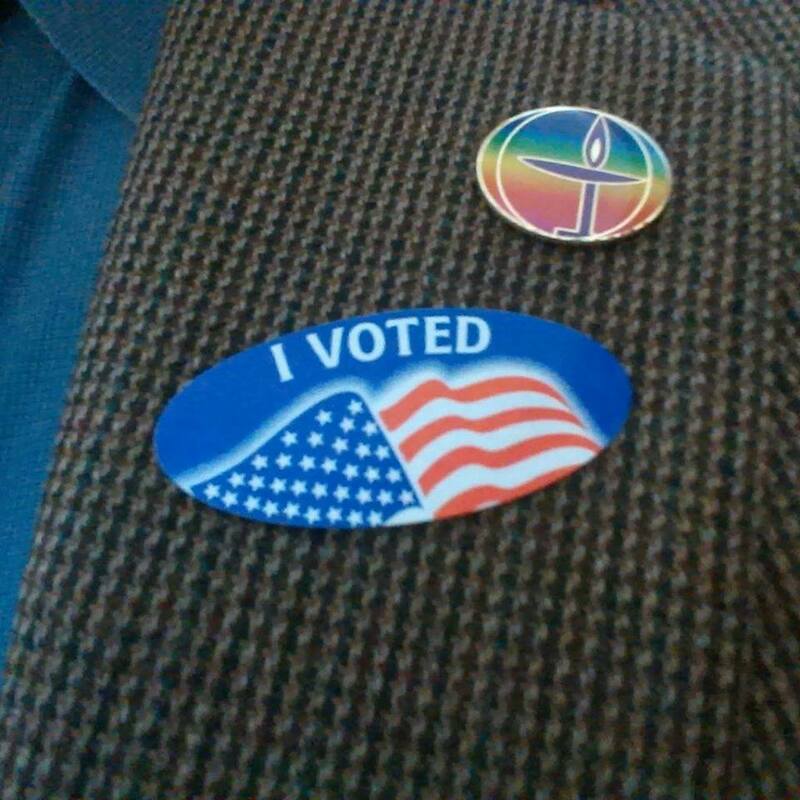 The congregation I serve makes its major decisions by voting. As a church belonging to one of the faiths descended from the early American congregationalists, we elect our own officers, we set our own budget and we vote to call our own ministers. One of the primary benefits of membership in the congregation, in fact, is the right to vote on such matters, though we do not exclude sympathetic non-members from discussing the issues, too. But it is a unique responsibility of membership to vote, to contribute in this and other ways to the collective wisdom of our decision-making. We trace this tradition of congregational self-determination back almost four hundred years. Indeed, with the rejection of religious hierarchy — rejecting both the king of England as the head of the church and the bishops as its officers — more than a hundred years before the United States declared their independence, the congregationalists were trying out democracy long before the country as a whole embarked on its similarly bold endeavor. Liberty was the watchword in both cases, but for the churches it was specifically the freedom of mutual love. After all, there is more to democracy than simply voting. Being engaged participants, whether as members or as citizens, is essential. And simply voting on an issue according to majority rule needs to be accompanied by a commitment on everybody’s part to stay in relationship, or else risk succumbing to divisiveness. It is a fact of life that there will always be differences of opinion, so the real question is not which opinion is more popular, but how to live and work together before and after the vote. The right to participate in shared decision-making is inseparable from shared responsibility for the health of the community, whether that community is one congregation or a whole country. This makes efforts to rig elections all the more distressing. I’m not talking about so-called voter fraud, which like other boogie men doesn’t actually exist. Apply some reasonable common sense to the idea of repeated visits to a polling station while pretending to be a different person each time and it is clear that such a scheme would have little impact but require lots of effort and risk. On the other hand, redrawing district lines to segregate certain voters or passing laws to prevent certain people from being able to vote at all are clearly ways to skew elections that, for all that they have the appearance of legality, are only sophisticated forms of cheating. And since they inevitably target marginalized individuals — including women, people of color and poor people — they are also unjust and immoral. We are already saturated with coverage of the various presidential campaigns in anticipation of next year’s elections, but this year’s elections — today’s elections, in fact — are just as important. Candidates for national office often begin at the local or state level, working their way up as their political careers gain momentum. Ensuring that we have capable officials who truly represent the will of the people, rather than special interests with deep pockets, begins — and is most critical — in so-called off-year elections. For all those people who can’t vote or are prevented from voting, each of us who can do so should embrace with joy and gratitude the right and the responsibility to vote. The purpose of an election is indeed to pick a winner, but when participation is low, whether due to voter apathy or deliberate disenfranchisement, then we all lose.